Two powerful figures square up for a final debate certain to spell defeat for one – and recent media attention seems to have swung hard one way. The investigators have a chance to uncover the truth, but they have precious little time to do it and an immovable deadline looming. I’ve been a fan of Nathan Hill since I picked up a copy of his excellent sci-fi game Foreign Element – and then ran an adventure on a suspiciously orange planet. 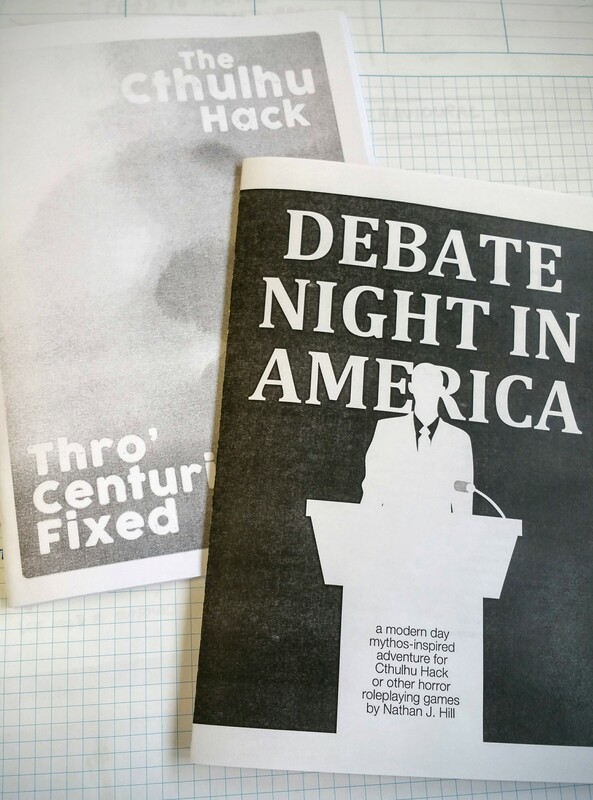 Nathan has chosen a particularly apposite moment to release Debate Night in America, an adventure he’s written for The Cthulhu Hack, but suited to any game of conspiracy-fuelled, supernaturally-steeped investigation. The adventure invites a sense of impending doom in a very strict, tight timeline – and I might even suggest you could swing something close to an actual countdown by running it at a pace of 15 or 20 minutes real time equals 60 minutes game time. An actual clock on the table that you advance, with the absolute certainty that the televised debate goes ahead at 7PM – that should have the players focused and increasingly frantic. Entirely viable as a one-shot for an evening or a convention game. I also found that a reference at the start of the final paragraph on page 18 had me thinking that you might have a cross-over with Thro’ Centuries Fixed – and my inference yesterday that I see a campaign potential in the mix. You’ll get it if you’ve read both adventure and the source story for Thro’. 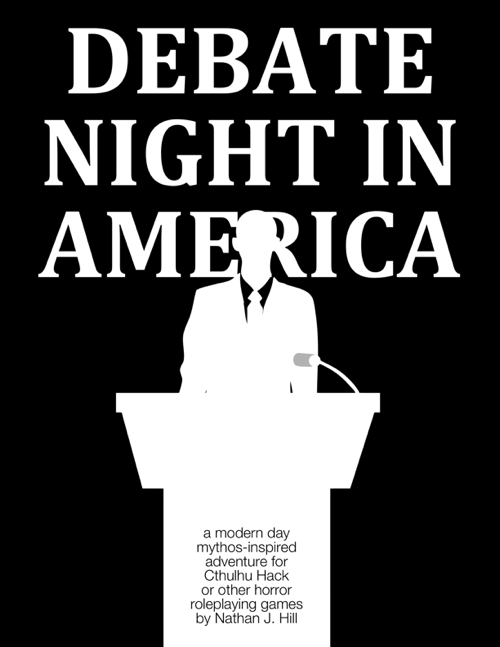 Nathan has made Debate Night in America available as a Pay What You Want and I ask you to donate a fancy coffee’s worth for his effort!